A view over one of the 3 prostrate stones at this location , to the erect 1.6m high monolith . It is suggested that these stones formed part of a stone circle, with a diameter of c.100m ! They seem to lie on a curve , but CADW makes no mention of a possible Stone Circle. 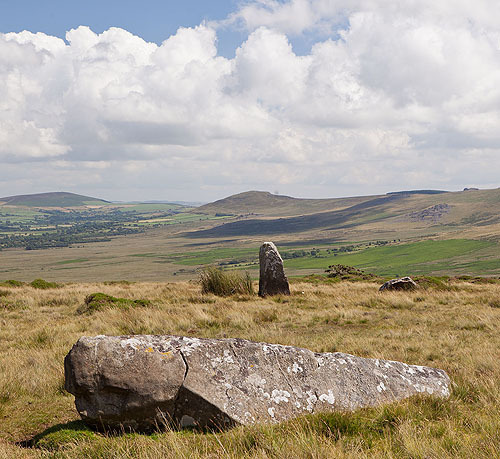 Location - These stones stand on the southern slope of Waun Mawn overlooking the steep valley of the Afon Pennant. From Tafarn y Bwlch follow a track ,close to enclosed farm land ,as it climbs up Waun Mawn.